Will the Tork Tech kit fit a '94-97 Thunderbird or Cougar? The issues that the '94-97 Tbirds/Cougars have are nearly identical to the issues that the '96-98 Mustangs have. Please read FAQ #4 as it explains in detail what TTI suggests for installation into the MN12 platform. There are no issues with heat exchanger installation up front. 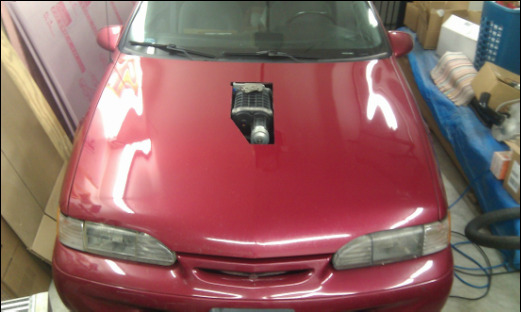 A raised aftermarket hood from SuperCoupePerformance.com or a large hood scoop is needed. The suggestion to switch to a '99-04 GT engine also applies to the MN12 cars. MANY owners have done this and we recommend it to simplify the installation of our kit. '96/97 Cougar with a MP112 Kit installed. Hood clearance is an issue and companies like www.SuperCoupePerformance.com offer several styles of raised hoods. '97 Thunderbird with a VMP 2300 supercharger sitting on top of a Tork Tech Terminator GT kit. This car makes far in excess of 500 RWHP ! What about a newer Crown Vic or Grand Marquis? Town Car? What about a 4.6L F150, Explorer or Expedition? Owners of these heavier vehicles crave a positive displacement supercharger with plenty of low end Torque (TORK!) to get them moving or pulling a load. We have numerous Crown Vics, Grand Marquis, Town Cars, and trucks/SUVs burning up the streets with Tork Tech kits in their engine bay and the owners are thrilled with the performance. The most obvious change that will need to happen to use the Tork Tech kit on many of the applications above is that their factory intake systems reside on the drivers side while the TTI kit uses the passenger side. It will be necessary to relocate the battery to the trunk or switch it to the drivers side once everything is moved over. There are other minor issues such as relocating a coolant over flow tank and the washer fluid tank, but these are minor issues. The owners who have already accomplished the Tork Tech installation are typically happy to share their experience on how best to handle these minor issues. We can share with you their email address if you wish to contact them. There are also several Panther platform websites that have discussed the installation of our superchargers in detail and we encourage you to check those out as well. There are no issues mounting the heat exchanger and only a minor issue as far as hood clearance goes. Owners tell us that there is a under hood brace that needs to be cut out to clear the blower but the actual skin of the hood remains intact. The last few years of the Panther platform used a Drive-By-Wire setup and this issue is easily solved by using a '07-12 GT500 throttle body on the Cobra inlet plenum. The bolt patterns between these two applications is similar but you will have to slot the holes on the throttle body to mate with the Cobra plenum. 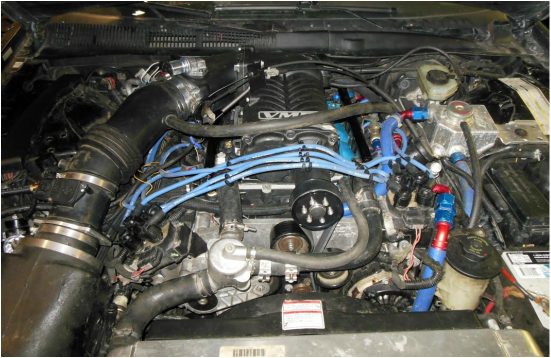 Here is a link to a detailed write up that a Crown Vic customer wanted to share .... http://www.scribd.com/doc/24110020/Tork-Tech-Crown-Vic#scribd Another great resource is "Tork Tech 2V Mustangs" on Facebook. This group has MANY Pather owners and truck owners who have kits or are installing kits so this is potentially one of your best resources to get advise from current owners. Once can easily join this group and we also suggest you LIKE or FB page "Tork Tech Superchargers" as we post numerous builds for your review also. Regarding the truck applications there are no issues related to utilizing the Tork Tech setup in these applications that we are aware of. Some changes will be required to make it fit but there will be no hood clearance or heat exchanger issues to speak of as there is a lot more room on these vehicles than in a coupe or sedan application. As long as the engine is a 2 valve with the PI cylinder heads the kit will fit fine.